We stayed at this house in January and it was the perfect home for us. We had 4 kids with us and they all loved it as well. Great views, great location! What could be lovelier than expansive glass patio doors opening to a wrap-around balcony overlooking Monterey Bay? Designed for grand views of the sea, this custom Pacific Grove home includes three verandas with lounge chairs… and a private dining area for two. Romantic arched doorways frame tiled outdoor living spaces, and indoors, serene colors create an air of peace and tranquility. One of our larger homes, Zatara sleeps up to twelve in five bedrooms (two kings, two queens and four twins) and 3-½ baths. 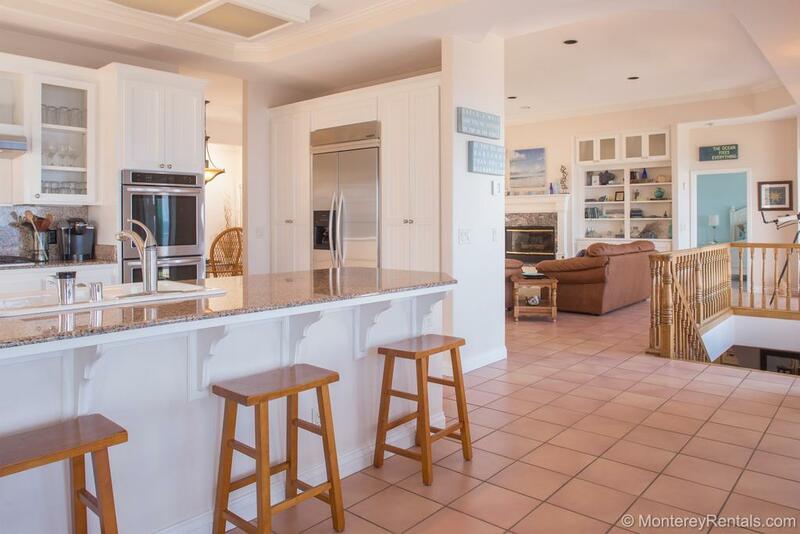 The spacious open kitchen and extensive granite countertops are functional for both meal preparation and entertaining, and two dining tables plus bar stools provide ample seating. Your home-away-from-home includes three flat screen TVs with cable, two DVD players, TV with X-box game system, CD/digital alarm clocks in each room, and Internet access. Leave the doors open to usher in cool sea breezes and whisk away the hassles of daily life. And if you can tear yourself away, head out on the coastal trail - you’re less than five minutes from Lover’s Point, Point Pinos Lighthouse, Cannery Row and the Monterey Bay Aquarium. Ocean view living and dining and a cozy sitting area by the fire. Two bedrooms and one bath on each side of the entry. Monterey Bay Property Management did everything possible to make sure our visit to Pacific Grove was perfect. The house has the most amazing views. The kitchen, dining and living room are beautifully decorated. We loved the dining room fireplace with the two comfortable chairs, perfect for a game of cribbage. Plenty of chairs on the deck to watch the waves crashing on the rocks. All the bedrooms were very comfortable. Great location, lovely walks along ocean path and to downtown PG. Easy drive to anywhere on the peninsula. But the house is so lovely you might not want to leave. The view is absolutely the best part. Great living space, updated kitchen. The only negative is the master bath and bedroom definitely need remodeled! Had a great time. Our family of 9, aged 5-73 enjoyed our several days inMonterey at Zatara. The spacious rooms, comfortable beds, gorgeous views of the Bay and proximity to just about everything suited us well. We could easily run along the coast, explore tidal pools or just sit on the balcony overlooking the Bay. The accommodation was well equipped for cooking and for eating as a large group as well as the common areas were spacious and suited for playing board games or watching TV together. The garage was a bit difficult to access as it was in the back part of the house with a bit of a tight turning angle, but this was a minor issue. We’d definitely rent this property again! The house was perfect, clean, well furnished and comfortable. It easily accommodated 8 adults and 2 children. We loved watching the ocean life from the deck and could hardly tear ourselves away the first few days. Kitchen was well equipped with dishes, cookware, glasses. We took turns cooking and it was a real pleasure to do so. The beds were comfortable with nice linens and plenty of extra blankets and pillows. It was very nice to have supplies, soaps and detergents, present when we arrived. We were a little surprised at the amount of daytime traffic on Ocean View but it was quiet at night. The driveway was a bit challenging with the four cars we had. A home with a view!!! We were a group of 9 long time friends looking to have a relaxing time in Monterey...and Zatara was perfect!! The views of the ocean are breath-taking!! Within couple of hours of being there, we were able to see seals, whales, plenty of birds, etc right from the balcony!! !Spacious bedrooms, comfortable beds, great layout of the kitchen, dining and the living room area with plenty of space to enjoy to enjoy each other!! !Plenty of TVs, DVDs, etc but who had time to watch anything? So many areas to sit outside on first floor or on the ground floor! There is a barbecue, if you are so inclined! We just sat outside on the balcony either sipping tea/coffee in am or wine in the evening!Mornings were awesome....going for long walks with miles and miles of changing landscapes.Great neighbors who welcomed us when we arrived...watch them feed the birds! !The decor on the outside blew our minds---people passing by almost always had to look at it and admire!! The grocery stores are not too far, the 17-mile road is also nearby....To sum it up, this was just perfect for us and would recommend to anyone planning to have a great time and need multiple bed rooms!! Our family of 12 had a wonderful week in July. The kitchen was well equipped, the beds and linens were comfy and attractive. It really felt like home except for the bathrooms and some of the door fixtures which need updating and repair. It is a beautiful house. Sitting on the balcony enjoying the ocean calm and action was a favorite. We will definitely go back! We are so glad you enjoyed your stay. The owner is gradually doing upgrades at the house (as they can be scheduled between reservations), so future guests can always look forward to improvements. My wife and I rented Zatara for 4 nights from March 28-April 1, 2017 to accommodate ourselves, our daughter, her husband and their six children. It was ideally located, ideally sized and designed, and ideally fitted out for our family holiday. We enjoyed the sunrise each morning, plus the birds, the boats, and the waves. The house is in good proximity to the Aquarium in Monterey. Point Lobos is a short drive, as are Carmel and its charms. The house layout was perfect for our family: my wife and I took the ensuite master bedroom upstairs, and our daughter and her family had their own suite downstairs, which afforded the parents the opportunity to keep tabs on the children ages 11-17. Parking was adequate for our two vehicles, though one must be careful backing onto the street. The area is quiet as can be. The kitchen was amply equipped with first class appliances and chef's tools, allowing us to prepare meals when we stayed home rather than enjoying the wonderful restaurants nearby. The living room and outside balcony were generously sized to allow everyone to gather for a movie while allowing additional room for group jigsaw puzzles, solitary reading and quiet contemplation of nature. The washer/dryer allowed us to keep the kids in clean clothes. The housekeeping prior to our arrival was impeccable: the place was immaculate. Overall, we highly recommend Zatara and certainly will return the next time we need something this size. Everything was very organized and easy! Thank you! Great house! Monterey Bay management was great/easy to work with. House was as expected, clean and well appointed. Beds were comfortable. Location and views were both outstanding. We stayed for three nights and managed to see whales, dolphins and seals right from the deck. I rented the house for myself and several people running the Big Sur Marathon. The layout worked well for our group - the open concept kitchen with deck overlooking the bay was perfect for a fun dinner in. I could live here! This place had beautiful views of the ocean, plenty of room for all my family, the beds were comfortable. Loved the beachy decor! It was just perfect!! We rented the place for 3 nights in April and truly loved it.The house is gorgeous with all the amenities one could hope for: well stocked with linens, dishes, etc. The view is just spectacular. No one wanted to leave! We will be back again!The manager was very responsive and easy going. Overall an A++. The Zatara house was a great house for our family when my daughter got married in Carmel last weekend. It was especially helpful on the morning of the wedding when the bridesmaids came over to have their hair and makeup done. There was enough room for the girls, the hair/makeup artists, and the photographers with lots of natural light and beautiful views. Other than some minor plumbing problems, everything else went very smoothly. The house was well stocked, the beds comfortable and the views of the ocean were priceless. This property was almost perfect in every way. It is just the right size for our family of 12. It is located right on the bay and the waves were awesome! The home is beautifully decorated, is very well equipped and is so very homey. If you need some space, there is little places you can go to get away from others. We absolutely loved it and have reserved it again for next year. Thank you for sharing your home! The house was beautiful and the view could not be beat overlooking the ocean. The kitchen was well equipped which came in handy with 12 of us and the BarBQ worked well and it was nicely located right next to the kitchen door. Location was wonderful, as we could walk downtown, walk along the beach paths, or just walk to Lover's Point for a cocktail overlooking the beach. We all enjoyed having all 3 fireplaces for added coziness and warmth during the evenings. Other than the bathrooms being a bit outdated and having a few minor maintenance issues, we loved the house. We will be back. A magical stay with our family: 5 grandchildren and 6 adults. The accommodations were convenient to walking, the beach...and "eating in" was a joy as the view was better than any you could find at even the finest restaurants! Only the 7 month old baby was left out of the "kids" bedroom which made going to bed a breeze because the cousins got to be together.We want to return next summer!!! This was definitely everyone's highlight of our 10 day vacation trip. Monterrey was beautiful, but this home was really the icing on the cake. The home was so spacious with absolutely breathtaking views. We were able to cook two meals at the home with no problems. We were 9 adults and had a lot more room to share. The location for key pick-up and drop off was located conveniently close by. The decor was lovely and the rooms were clean. Thank you and hope to be back! We absolutely LOVED our stay at your home. Everything was just as advertised and all pictures met every expectation!! We look forward to visiting again and staying in this beautiful home on the ocean with spectacular views. We organized a middle school class reunion at Pacific Grove. We rented Zatara, Bellisima, and Chateau Sandy Toes to house twenty around seventy-five-year-olds and use Zatara as the base. We had a wonderful time. All three houses are spacious, clean and beautiful. The beds are comfortable. Not to mention that Michelle and Sandy are so helpful that they even mail the items we left behind back to us. Thanks for the memory. Our extended family stayed in this home while visiting Monterey for Grandma's 92nd birthday. This home was super clean, beautiful and comfortable for our family of 10 with plenty of room for everyone to spread out. The Property Managers were quick on the scene when we had issues with the cable TV. Kitchen was well equipped, there was nice seating areas indoors and on the deck and patio with magnificent views. There was plenty of room for everyone to sleep and the beds were comfortable. I highly recommend this home and look forward to renting it again next summer! We rented the place for my 60th Birthday Celebration and I truly cannot think of anyplace that I would have rather been.The home was gorgeous with all the ammenities one could hope for. It was very well stocked with linens, dishes, etc. The view was incredibly spectacular!! We are hoping to get together and rent the home again in the future, just want to make our stay longer the next time. We truly didn't want to leave! This property has a large family gathering place. It's location right on the water was memorable. The kitchen was well stocked. The 3 gas fireplaces were the icing on the cake. Our entire family votes this property as a winner! We had a wonderful time at the Zatara House. The house is as pictured. The rooms are comfortable. The view is amazing!! My family is mostly early risers so we all enjoyed the sunrise in the morning with a cup of coffee. We had amazing weather the week we were spent there. The house is stocked with everything that you need to make you stay comfortable. We cooked most of our meals at home and all the appliances worked very well. Our stay was for our son's wedding in Monterey. Our family consisted of our children, aunt and uncle, cousin, neice, grandmother, and friends. We all enjoyed our time in the house, especially grandma who loved looking out at the ocean. The only downfall is that the house was a little cold so we turned up the thermostat but that didn't seem to help. Other than that, the house provided a great time for all!